← Who are your picks for the 2012 Carnegie and Kate Greenaway medal? The very deserving winner of both the 2012 Carnegie and Kate Greenaway Medal is A Monster Calls by Patrick Ness and illustrated by Jim Kay. 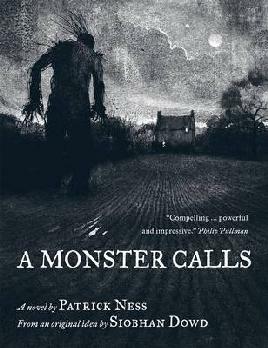 Patrick Ness is one of my all-time favourite authors and I absolutely LOVED A Monster Calls. It’s a beautiful, heart-breaking story and was probably my favourite book of 2011. If you haven’t already read A Monster Calls or you loved it and want to own a copy you can win one of 2 copies that I’m giving away. All you have to do is leave a comment below telling me your favourite childrens or young adults book. Competition closes Friday 22 June (International). Inkheart is my all-time favourite children’s book. Every time I read it I feel like Cornelia wrote it just for me. It’s perfect. Me too! My copy looks so sad and beat up because I’ve read it so many times. Divergent by Veronica Roth. It’s very hard to pick only one, but this is my most recent favourite. The Boy in Striped Pyjamas – so innocently naive yet with the constant undercurrent of the intense cruelty of war. Gives me leaky eyes every time. Anne Frank of course is right there too. The Red Tree by Shaun Tan. Beautifully drawn and wonderfully written, it tells the story of one young girls struggle with life. Ever feel lost? Don’t know what’s going on? Feel alone? This picture book gives you hope. Wonderful. I have bought it for people as birthday gifts and they have loved it. Own it. The Fault in Our Stars by John Green is one of my current favourites. There seem to be an awful lot of really good YA books being published at the moment, so it’s really hard to choose just one! My favourite book was Alleen op de wereld (Alone in the world) by Hector Malot.